Yes, I'm back. No Prosciutto. They did have brats, but I had a hamburger instead. 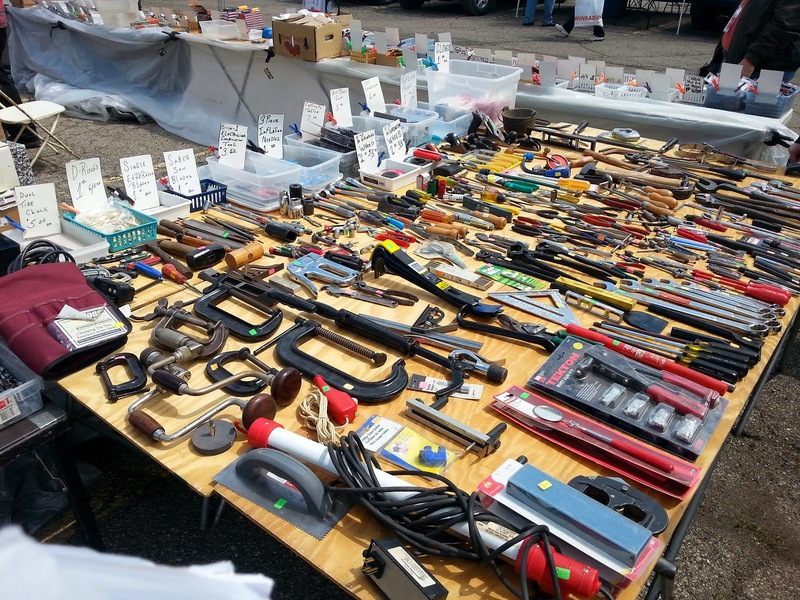 There was all manner of geekery on display, and despite weather so rainy that we missed about a third of the flea market, I had a great time and I hope Turk Turon did, too. When a storm blew through about four o'clock, the flea market folks all covered up and once it was over, there was only about an hour left. So they did what the rest of us did: mill around inside, where there are also plenty of interesting things. Alas, a scratchy throat that morning was a bit more so when we returned and I've got a full-fledged sore throat this morning. And etc. Slept in and that helped. Also had a calf cramp at some point and the usual knot has me limping. Was it worth it? Yes. Yes, it was. It's a cart machine. A first-generation one! Homemade transmitter -- pretty sure the cabinet was once a Motorola two-way base transmitter, 1950s-vintage. 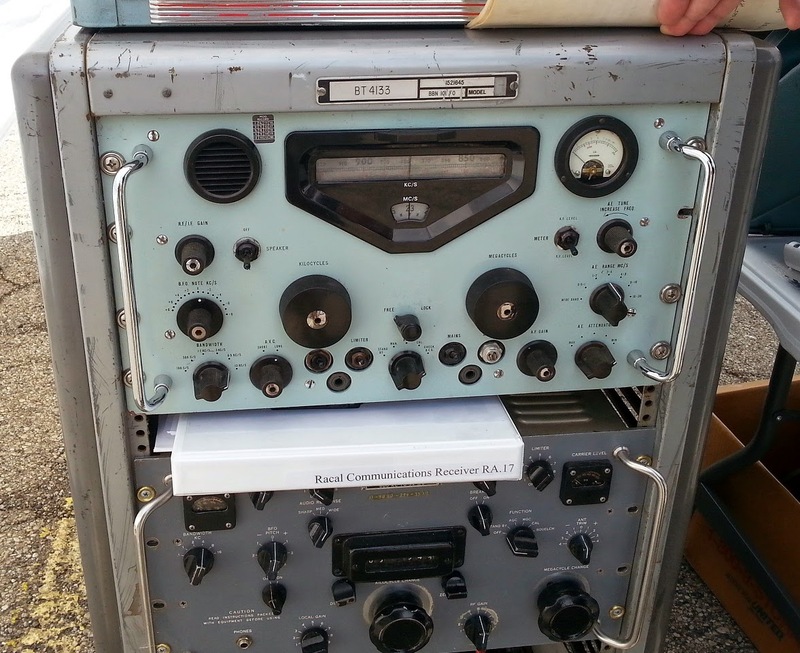 The light blue think is a Racal receiver, a very high-end communications receiver from the UK. They don't make 'em like that any more, but they should. 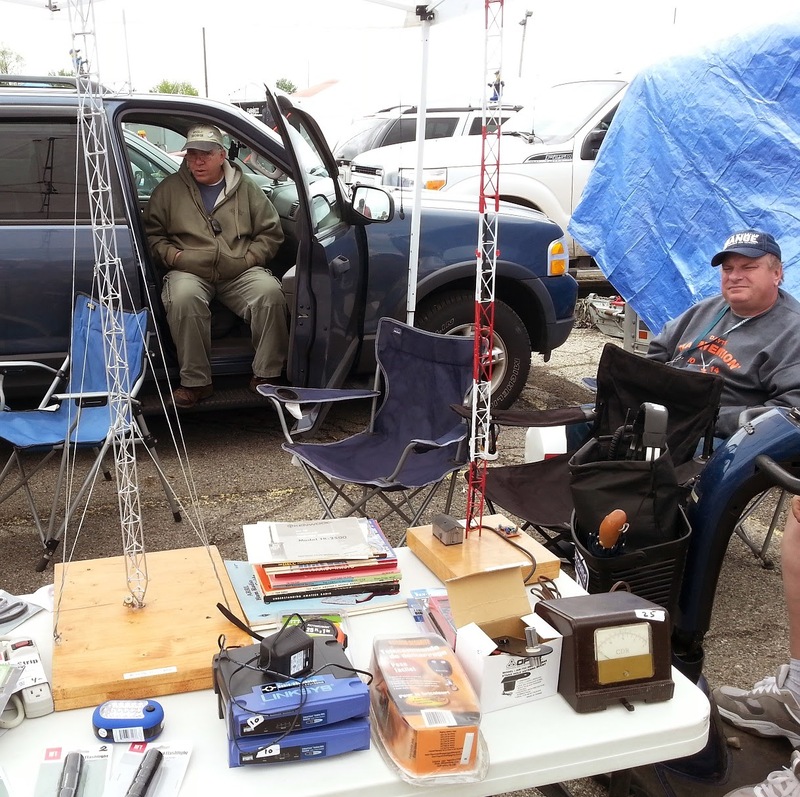 Scale-model towers -- scaled for the two-meter ham band, just above 140 MHz. Yes, they work. I didn't get a photo of the guy with a blue LED-covered antenna hat, who need a radiation warning trefoil T-shirt to complete the look, but there are plenty of other snapshots to share, and more to follow. That's an R-390 under the Racal, I recognize it from my Navy days. I've been meaning to ask you about this, um, thing, which was staring me in the face the other day. Looks like as good a time as any. 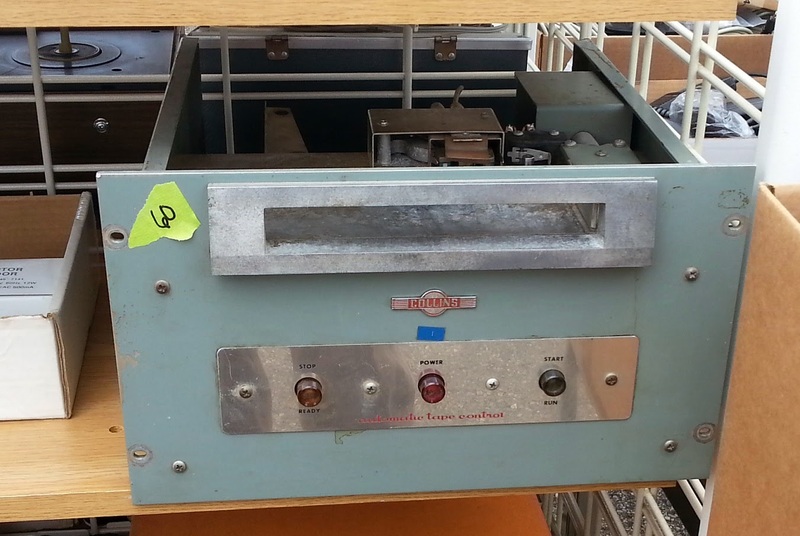 Oh, yes, that -- RCA rack, RCA "On-Ar" light ($$$$ -- I hope this location is secure), giant toy knife switch, possible bracket for transformer or ?? (rear rail), audio patch panel, RCA frame for amplifiers from their solid-state or (maybe) late tube era, 2 RU blank panel, "Christmas tree" terminal panel and mysterious box (rear rail). 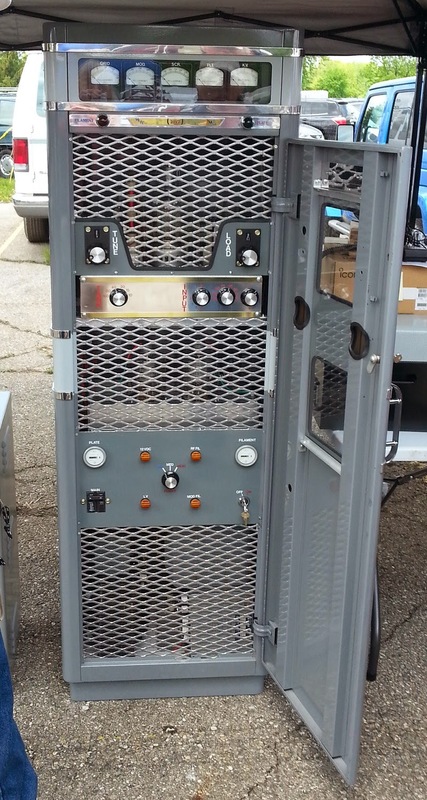 This apparatus is located in a downtown building, recently reopened as office space after years as a hardware distribution point; one occupant is a 100-kw FM station which presumably used to own said apparatus. It's now on display in the lobby. Glad you made it and had fun. The crud hit me Thursday and I didn't make the show for the first time in 20 years. Maybe we can meet up for a brat next year. Wimmen: You Can't Leave Earth Without Us! Steak. Potatoes. Salad. There It Is. Well, That Was Fun. Or, In Fact, Not. Dinner For Breakfast Or Breakfast For Dinner?